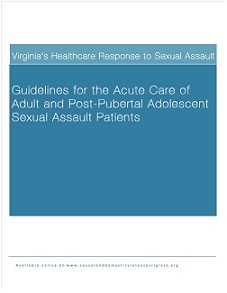 The document incorporates recommendations from professionals across Virginia, as well as information from current guidelines from relevant state and national resources on the management of sexual assault patients and the collection of forensic evidence. The guidelines provide a framework for the critical role of the healthcare sector in meeting the needs of sexual assault patients and the criminal justice system. They are organized around four fundamental criteria and were developed to address the healthcare response at the community, facility, and individual levels. While these guidelines were developed specifically for healthcare professionals and facilities, the healthcare sector is just one component of a comprehensive response to sexual violence. These guidelines will also be a valuable component of statewide efforts to establish coordinated, collaborative, and compassionate responses to sexual violence in every community in Virginia. Published by Virginia Sexual and Domestic Violence Action Alliance and Virginia Chapter of the International Association of Forensic Nurses December 2009. 127 pages. On July 1, 2013, Virginia enacted legislation that provides a procedure health care providers may use to evaluate incapacitated patients who may have been sexually assaulted (see § 54.1-2970.1 below). The legislation is intended to be used when a sexual assault examination and physical evidence recovery is prudent, but the adult patient is unable to consent and timeliness of evidence collection is crucial prior to destruction by medical interventions or bodily functions. The law outlines specific procedures and criteria that must be met in order to allow the examination and evidence recovery without the patient’s consent. In November, an addendum to the Healthcare Guidelines was released to provide guidance to healthcare professionals on the use of this new process. It is expected that the new consent process will be infrequently used, as consent for the sexual assault examination and physical evidence recovery may be obtained from next of kin, guardians, or from the patient after the patient regains the capacity to consent following temporary incapacity. As coalitions, may we lobby? Should we? It all seems so unclear, and many coalitions struggle with the particulars of lobbying. By its nature, a coalition is the advocacy organization for the state or territory on issues related to sexual violence. Coalitions may and should lobby. This resource presents the current federal guidelines and limitations as they affect coalitions and any coalition staff responsible for lobbying. State provisions also apply and you will need to seek out resources and legal assistance in your state or territory to help your coalition navigate and maintain compliance with any restrictions on lobbying.